“If you want to fly, you have to give up the things that weigh you down” – Unknown. Sky Yoga is a contemporary yoga style where traditional poses are performed with the aid of a fabric sling. Classes are fun, challenging and diverse. Inspired by the Vinyasa style of yoga, the poses flow in creative sequences, your relationship to gravity is altered, your awareness of balance and stability is heightened and your body is left stronger and more flexible. Learn the skills to help your students go deeper in their practice as you go deeper into yours. 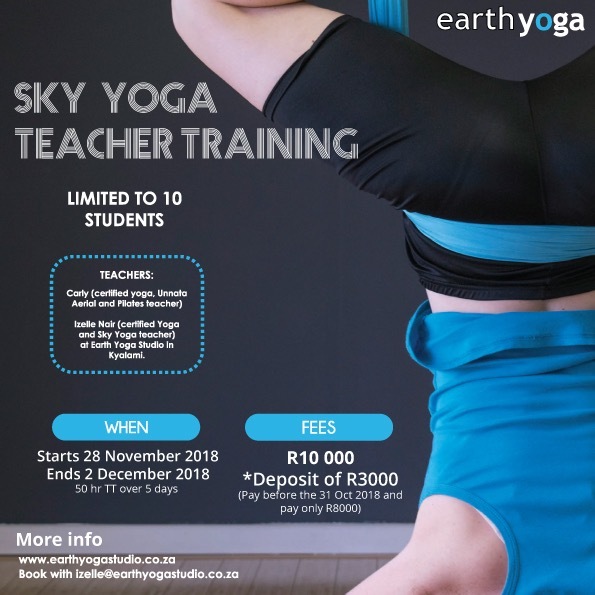 The Sky Yoga teacher training will be facilitated by Carly Bowden (certified Yoga, Unnata Aerial Yoga and Pilates teacher) and Izelle Nair (certified Yoga and Sky Yoga teacher) at Earth Yoga Studio in Kyalami. The training is limited to 10 students so you are guaranteed personal attention and time in the hammock to practice. The course does not require any previous aerial experience but does demand a daily practical application of all postures covered and is physically demanding. This Sky YTT takes place over 5 days. Early Bird: R8 000 if you pay by 31 October 2018. A deposit payment of R3 000 is required to secure your place. The balance is required by the date of course commencement. Payment plans can be arranged should you require. This Sky Yoga Teacher Training is offered to certified yoga teachers of any yoga tradition. You will be required to attend a min of 5 Sky Yoga classes as a student. You will be asked to assist in a min of 5 Sky Yoga classes taught by a certified Sky Yoga teacher. 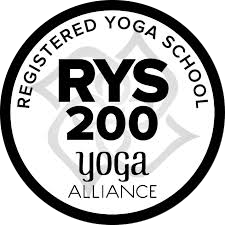 You will be required to teach a min of 2 full Sky Yoga classes prior to certification. To complete and pass a written and teaching exam.